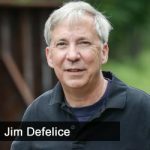 Gary Pinkerton talks with author Jim Defelice, as the two of them discuss his books and what he’s learned as he’s studied military (and other) leaders for his books. Jim has written 3 books about Chris Kyle, including American Sniper which was turned into a movie featuring Bradley Cooper. The two also discuss Jim’s newest book, The Pony Express, and why he has decided to write the stories he’s written (which is over 50 books).